I'm going to have a look online but thought i'd bring it up here now. I'm in newcastle and am getting a car transported from adelaide to sydney, it has a south australian rego. I'd like to drive it up so was looking to get a pink/blue slip and then visit the RMS to get the rego. Now am i right in thinking I can do so with the SA plates? 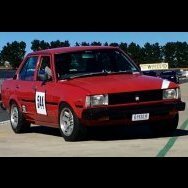 I bought the car in my avatar from Adelaide, and live in nsw. you can drive around on SA rego, but will need a blue slip when it lapses in nsw. Hey thanks for that. So once I get it the only time limit is the duration of the rego?